The interior of the establishment has not changed with the renaming and still presents the same attractive elegance as pictured in my earlier review. On this visit, I had a reservation for 6:30 pm and I arrived just a little earlier in order to enjoy a single malt scotch in the nicely appointed cigar lounge. Cigars are available for sale there, albeit at a fairly hefty premium, but, fortunately, they have no objection to patrons bringing their own. Cigarettes, I should note, are not permitted. 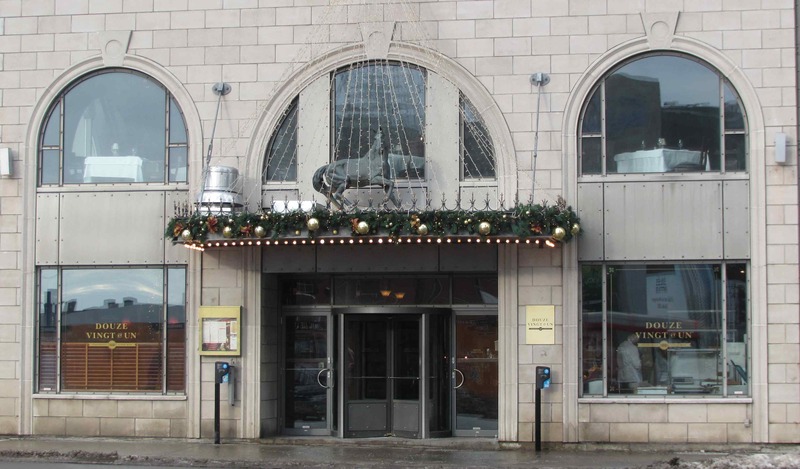 The restaurant, they not only maintain an impressive lobster tank, but they also display other seafood currently available on the menu and, in the foyer area, there are display cases showing the huge and lovely cuts of beef from which the steaks are cut to order. After I was seated, my waiter brought around several other plates of shellfish and steak for me to inspect and I couldn’t resist taking a picture of the lovely cuts of meat you see above. 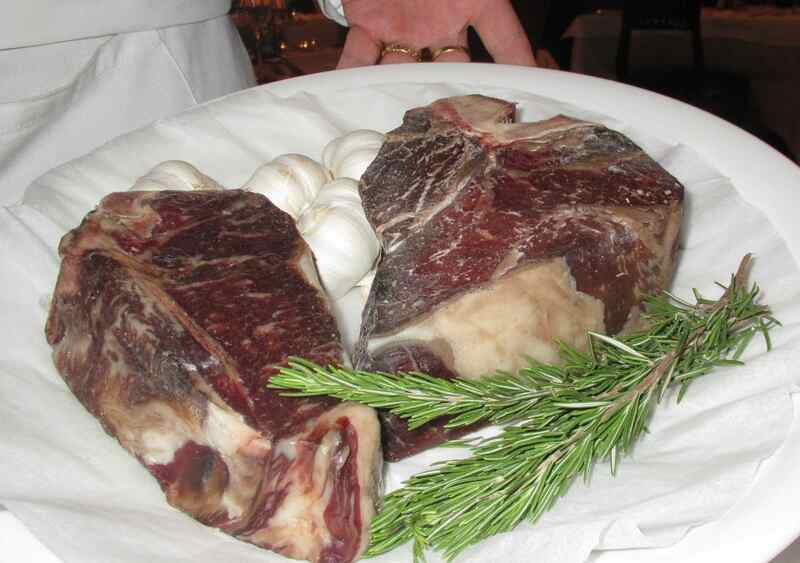 The steak on the right is a Porterhouse and the other, I believe, a rib-steak. Both, you will note, are beautifully marbled and are each almost three inches thick. I had half a mind to sample the Kobe Filet Mignon they had on offer on the evening of my visit but the lure of the lobster tank proved irresistible and I opted for a 3.5 pound specimen which was the smallest of the lot. My waiter brought me the beast for my approval before consigning it to the cooking pot and you can see the massive size of the claws. Incredibly, I could have had a 5.5 pound one if I desired and I gather that 8 pound specimens are sometimes available. I decided to begin with a some fresh oysters. 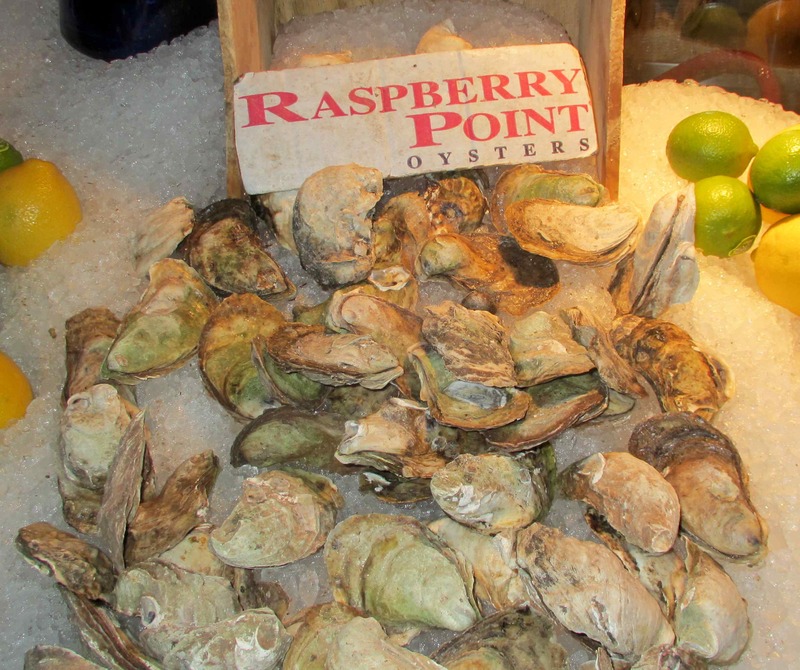 The restaurant had 4 different types available that evening; Malpeque’s, Pickle Point’s and Raspberry Point’s from PEI, as well as Kumamoto’s, which are a Japanese variety now farmed in BC and Washington State. Kumamoto Oysters – I was very much looking forward to trying these as they are a distinct species from the Atlantic and Pacific types. They are said to be a great oyster for ‘novices’ as they are generally quite mild and favored for a sweetness with notes of melon. For me, on this occasion, however, this variety was distinctive only for being the smallest I have ever had, with the smallest coming in at just over an inch long. They were, I am disappointed to say, about the least enjoyable I have ever eaten. The flesh was pallid, almost as though the oysters were in the spawning cycle, and the taste was insipid to match. There was a sweetness, along with a faint hint of brine, but these qualities were bland and uninteresting and carried no sparkle and none of the melon notes I was expecting. I could only rate them at a 1 out of 5. Pickle Point Oysters – I forgot to take a picture of the platter I was served but, here, you can see some of this variety at the shellfish display at the front of the restaurant. 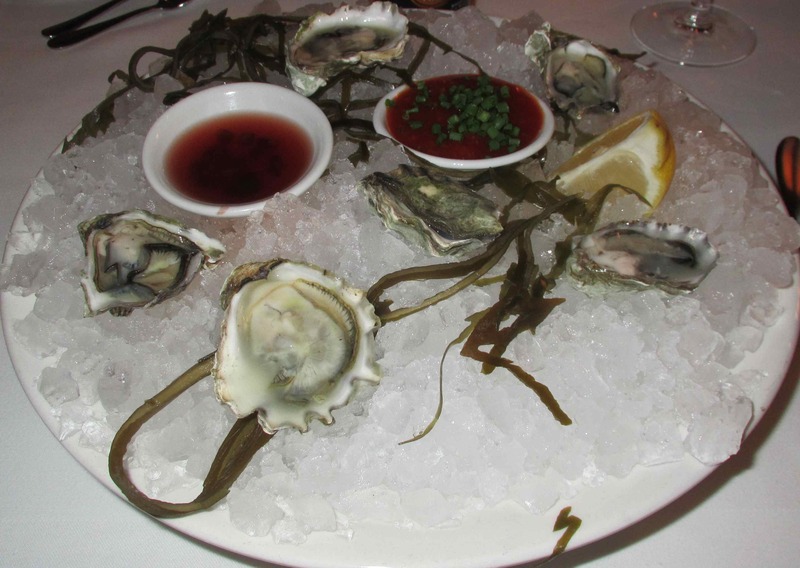 As with the Kumamoto’s, the fresh oysters are served with a choice of a fairly standard horseradish and tomato based seafood sauce, and a pleasant, tangy Mignonette. I almost never use condiments on raw oysters, preferring the taste to be unadulterated, but on this occasion, I did use the Mignonette on the last couple of my Raspberry point selection as they were not up to their usual standard. The texture was excellent, and there was a fairly nice brininess at the outset, but the usual sparkle was a bit flat and tired. I gave them a 2 out of 5. I recall reading a review by another critic who ate at this establishment and complained about being served a lobster that was overly tough. The truth is, though, that once you get beyond the 2 pound size, lobsters are generally not quite as succulent as they are when smaller, and this is especially true of the tail meat (which is the most favored portion) and, indeed, frequently the only part, other than the claws, that many people consume, even when served the whole animal. There is a compensation, however, in that the smaller legs, and the meat inside the body are better, at least to my mind, than in the small sizes and this was certainly true with the one I was served on this visit. The claws were fabulous and the tail meat, while a bit tougher than on, say a one and a half pounder, was still very sweet. I am a little bit embarrassed to say that I was unable to completely finish it all, actually, but my server wrapped up the remaining half of the tail for me and it made a terrific lunch the following day. All sorts of side dishes are available for both steaks and seafood but I didn’t choose any of them given the size of the lobster. 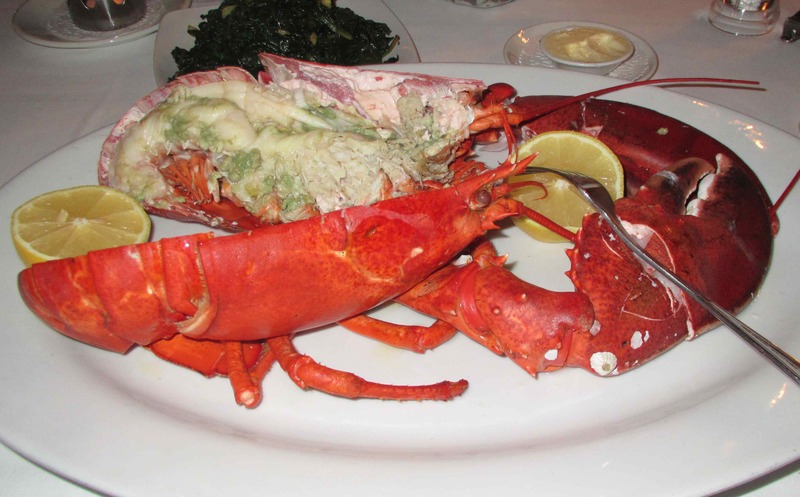 I was served, however, with a complimentary dish of spinach sautéed with pine-nuts and garlic, which you can just make out behind the lobster in the above picture. Personally, I prefer baby spinach to the larger variety used in this dish (which I find has a very ‘earthy’ quality), but it was beautifully cooked and very tender. Together, with the wonderful lobster, the entire course rated a 5 out of 5. My evening at Douze Vingt-et-un was a thoroughly enjoyable experience and the high spot of my trip to Montreal. It is unfortunate that the oysters were not at their best but, as I say, I don’t hold this against the restaurant in any way and was glad to have tried them. The service was, as on my first visit, absolutely superb and, in fact, it was even better on this occasion. My only criticism of my last experience was that the service, by a multitude of different persons was a little too attentive but, this time, I had a primary and secondary server only and both took great pains to make me feel like a really valued customer. They helped make this one of my most best dining experiences ever. Actually, I don’t like when they do that either. I usually ask them not to but I forgot on this occasion. That lobster is huge, so I’m not surprised you couldn’t eat it. I would have expected them to clear away some of the nasty green bits in the body of the lobster if they serve it cut in half like that. Glad to read you had a better time than at the red pepper Chinese place! A lot of people avoid the ‘green stuff’ (Tomalley) because of the appearance but in fact it is a really delicious treat for those who enjoy it (like me). 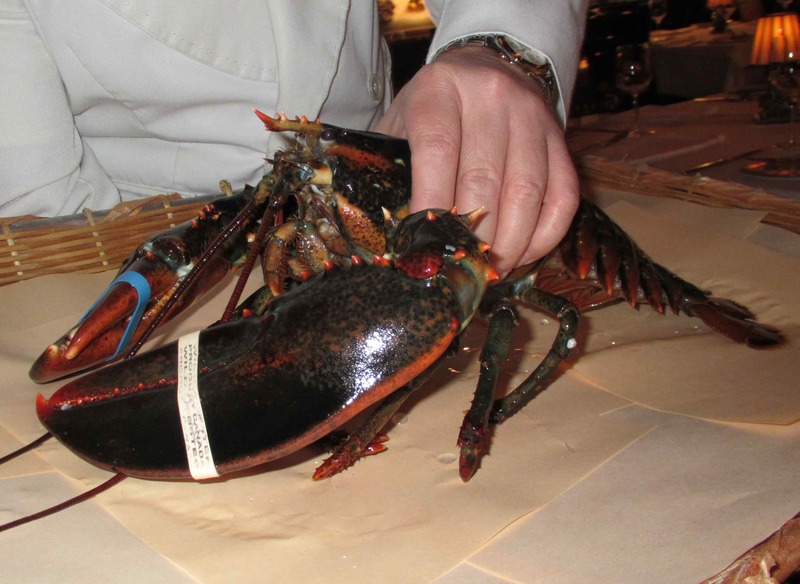 Wow….that is one huge lobster! I myself love the smaller ones, since I don’t like the “green stuff” 🙂 Shame about the oysters, and I too agree on two points, I always eat them sans condiments, and I didn’t like Kumamoto. Not if you have tried Galician Oysters….yum! I’m not an oyster fan but those steaks look gorgeous. I’ve never been to Montreal but if I ever visit I’ll be going to Douze Vingt-et-un for sure. Interesting that they allow cigars but not cigarettes. To be fair, cigar smoke smells a lot more pleasant. I’ll be going back. I really want to try the Kobe-Wagyu Beef but even a Filet Mignon is about $140.00! Oh, five stars! Last time, I remember we went to eat lobster in Montreal…it was not good enough. I will keep this in mind. Thanks.